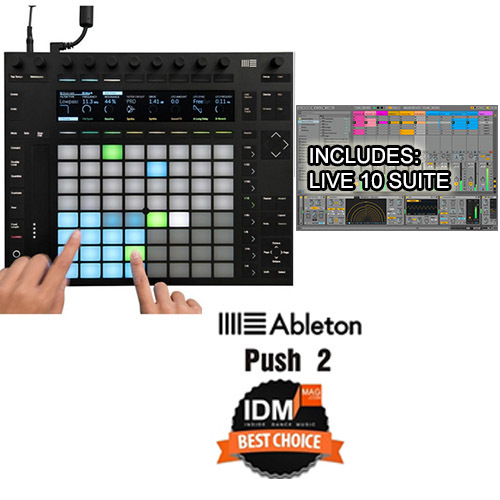 Ableton Push and Live work seamlessly together to provide the best of both worlds: hands-on hardware to make something from scratch, and full-featured software to fine tune and finish your song. The new Push now puts even more elements of song creation at your fingertips. Play and program beats, melodies and harmonies. Use new sampling workflows to slice samples across the pads, play single hits, or play back time stretched samples. Quickly browse, preview and load anything from your library of sounds and instruments. And with smoother, more responsive pads and a multicolor display that adapts to show exactly what you need, Push now brings a new level of playability. The multicolour display is constantly adapting to show you exactly what you need. It provides enough information to keep you in the creative flow without adding distraction. Push’s pads are carefully made to feel just right for musicians of all kinds. The control buttons are seamless, nearly flush with the surface, and provide a subtle ‘click’ when pressed. Push is slightly thinner and a little lighter than its predecessor, making it easier to transport from studio to stage. The upper shell is a thick but lightweight plate of anodized aluminium. From the initial planning to the final engineering, Push is an instrument made with Ableton’s careful attention to detail.